This Taylor of Old Bond Street Shaving Gift Set contains a Handmade Pure Badger Hair Shaving Brush, an Imitation Ivory Mach3 Razor and a Taylor's Sandalwood Luxury Shaving Cream tub - the perfect gift. The Brush: This Pure Badger Hair this brush will provide many years of faithful service as well as going a long way to helping you achieve the perfect shave. This superior shaving brush will exfoliate the skin and lift and soften the beard prior to shaving. Pure Badger Hair brushes use finer hair than most badger hair brushes - most suitable for using with shaving creams but still very useful for using with soaps too. The Razor: The best of both worlds, the quality and tradition of Taylor of Old Bond Street coupled with 21st Century Gillette Mach 3 technology. Balanced to perfection, the handle provides exactly the correct amount of weight to length ratio every successful razor needs. The faux ivory handle gives a fitting, traditional look to this high tech shaver. 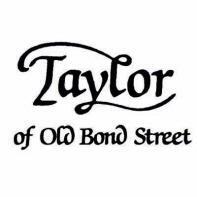 In striking black lettering across the handle is 'Taylor of Old Bond Street, London, England'. The new generation of Gillette Mach3 ® Cartridge Blades use thinner, finer blades, with Gillette's most advanced low resistance coating. Designed for less tug and pull, these new generation blades will provide a close, comfortable shave. The Cream: This cream will create a smooth, rich lather whilst moisturising the skin and softening the hair to give a better shave. This is Taylor's bestselling shaving cream, it has a traditional, masculine fragrance of sweet scented sandalwood and cedarwood. This luxury set is packaged in a very attractive Taylor's branded, satin lined presentation gift box. Ensure you are using a clean sharp Gillette Mach3 cartridge blade. After applying a pre shave treatment, use a couple of drops of warm water with the Sandalwood Cream to create a rich lather then paint onto face. Dip the razor into warm water and begin to shave. We recommend that you shave twice with the grain and once against the grain. Once finished, rinse the brush with warm water, flicking excess out and store on a stand, upside down, to ensure the knot stays in place. A fantastic set - perfect for wet shaving beginners or those who love the Taylor's Sandalwood collection. Very well presented so ideal for a gift.